Flame is an actual experience I had starting around 1989 or 1990 on Maui in a hotel Bath in Kahului near the Airport. Since after this experience I began to contemplate how Flame's species actually began to evolve into Flame right about now. (20th and 21st century) Thousands of years later Flame became a time Traveler and rescued humans from Maldek(now the Asteroid Belt) after a thermonuclear war and brought the survivors to Earth. Some of the other information is to show you just how the octopus has been found to be likely the single most intelligent non-mammal in the ocean. Though this above article called "Flame's Land Suit" might seem outlandish to you, I must confess when I first experienced "Flame" I was in a Kahului, Maui, Hotel near the airport. I was taking a bath and all of a sudden an extremely intelligent 10 foot tall Octopus started communicating with me. Since I had already studied with Native American Medicine men in the U.S. , and with Tibetan Lamas and monks in the U.S. and India and Nepal I could deal with this experience much better than most people. This happened in late 1989 when I was living on Maui with my family in Hana and Paia during that time. Later I wrote more about "Flame". "Flame's Land Suit" was inspired by meeting one of Flame's likely ancestors telepathically in a local Aquarium. I also found out later that in a public aquarium video cameras revealed that the large northern pacific octopi hunt sharks by suffocating them by stopping them from swimming and clogging their gills with their tentacles so they can't breathe water. So, from all this the octopus is possibly the most intelligent non-mammal in the ocean. I found my writings that I had on my older website at Yahoo Geocities before I moved it to dragonofcompassion.com, my new website. However, I realized recently that I hadn't moved Flame to the new site. So I found the documents on my external hard drive that I can move between all my computers and decided to place it here for safe keeping until I make a copy and send it to my other website. Here it is. Flame first came to me in a hotel in Kahului, Maui, Hawaii. I was taking a bath after returning from a visit into Haleakala Crater when "Flame" came to me. This was 1989. At first the experience was strange to me. Having communication with a telepathic time travelling being that looks something like a 10 foot octopus is just a little surrealistic. However, it happened. At first I had trouble because I was having difficulty finding common ground even telepathically with this being even though I have been perfecting telepathic communication since I was about 2 years old. However, after he explained he was studying all my soul incarnations I was able to put forth more effort towards communication regarding that point of reference. Flame then mentioned about how he had tried to save Maldek, the once fifth planet from our sun that is now the asteroid belt. This really peaked my interest. I then asked him if the survivors of Maldek came to earth. He said that since the shockwaves from the explosion of Maldek as well as many pieces of Maldek impacted the earth that most dinosaurs bigger than a dog perished within the next year. He said he took the human survivors to the nearest non aggressive planet for Maldekians. However, the Maldekians were not comfortable there as they were made fun of and harassed by that planets original colonists. This was mainly because the original colonists left Maldek to avoid religious persecution much like many of the original colonists who came to America. The Maldekians then begged "Flame" to get permission from the Galaxy to give them earth since no technically intelligent humanoids lived there yet. Flame got permission from the Galactic Government to allow the Maldekian survivors to settle on earth. However, they could never legally own earth because of the destruction of Maldek. They could only own their timeline. This was my introduction to conversing telepathically with Flame. In order to keep Flame straight from his son I am using the name Purple Flame because if you remember, Flame's appearance is red and orange like a flame with a blue beak and blue purple eyes. If you remember Flame's name comes from the fact that when Flame moves he looks a lot like Fire or Flame. Likewise, his son Purple Flame's name come from the fact that his colors are predominantly purple and blue. However, his eyes are the same purple blue as his father's and his moth beak is also blue. Purple Flame wishes me to tell you how his intelligent species began. He says that time is protected by the Galaxy so there is no danger of sharing this now. Though the octopi that Flame and Purple Flame sprang from evolved on earth, something happened in 2002 at the Monterey Bay Aquarium that changed this evolutionary process. Scientists found that some octopi were very intelligent through playful experiments with their "pets". One scientist found that one of his little Octopus friends could actually take of the lid to a glass jar in a tank so he could climb inside and feel safe. The scientist had an idea. He thought,"What if I could train and octopus like an ape or a monkey or a dolphin and do actual undersea work for humans?" This one octopus we in our species call "forerunner" or "prototype". The first is more our word the second was more the human word for the octopus. "Forerunner" was extremely playful and intelligent and loved that man who was a scientist. They had a very fulfilling and harmonious relationship. Hundreds of years later long after "prototype" and his friend had passed on prototype's genes had been passed down through his mates and his offspring. By 2300 there wer 150 living descendants of prototype. By then the govenment had become interested in these obviously useful and evolving octopi. They had been bred bigger for strength in doing underwater tasks in Monterey Bay. "Prototype" had only been 2 or 3 feet long. However, by 2300 prototype's descendants had been bred and genetically altered to be three times as intelligent than prototype and two or three times as big as "Prototype". Underwater devices had also been designed specifically for this growing family of genetically altered Octopi to do underwater work with. The "Prototype" family became very valuable because robots had a short shelf life and these Octopi had learned to train their young to use the equipment. All "prototype" Octopi were rewarded with food if they did their tasks correctly in the ocean. This gave all the "prototype" octopi the motivation to do the work to survive and be fed good food. The octopus young were trained to see their "work" as play that one did for food. So they learned to enjoy there tasks. These descendants of "Prototype" carried miniature video cameras embeded like a third eye in their bodies. Humans could then observe in their own good time the efficiency of prototype's descendants on digital video feeds transmitted to their home offices sometimes on the other side of earth from where the octopi worked. Sometimes the supervisors were not human but human created constructs that were either robotic or bio-robotic otherwise known as psyborgs. Later this growing symbiosis between robotic, bio-robotic and octopus grew eventually into something more like the beginnings of a semi-society and civilization. By the year 2500 this symbiosis was found to be very valuable and was used by humans in exploring and colonizing aquatic worlds on other planets. Some of these aquatic planets were abandoned by humans when the colonists either died or revolted against earth. On one of the planets on which the human colonists died of a new disease endemic to that planet it was thought too dangerous to retrieve the symbiosis of octopi robotic and bio-robotic lifeforms. It was on this planet that we began to evolve all together without any earth human supervision at all. It was in our individual and group self interest to form even stronger bonds. Over thousands of years Prototypes Octopi descendants grew in intelligence and continued to evolve culturally. We developed religions and governments just like mankind of earth. We also developed suits to move and survive in oxygen based and other gaseous environments as well as in the vacuum of space. Eventually, we developed space travel so we could travel back to our homeworld, Earth. However, when we finally made it back to earth hundreds of thousands of years had passed. We had grown to be around 8 to 10 feet in length from our original 2 to 3 feet. We looked forward to meeting once again with our human benefactors. However, when we returned to earth all human civilization was gone. We also found a war going on in the vicinity. Since we had mastered time travel as well as space travel we hid in another time to avoid detection by the warring factions. We traveled back in time to the time of prototype but there was not way to communicate with prototype or his progeny on earth. We were horrified at the slave master relationship that we perceived between humans and prototypes descendants on earth. We realized that we had idealized humans humans incorrectly because of the total lack of understanding of the octopi at the time. With our more sophisticated understanding of equals as well as masters and slaves we had to soul search how all this had come about. During our relentless study of time and all this we found a strange anomaly. One of our future race of Octopi even more evolved than we were had actually caused the introduction of humans onto earth millions of years before "prototype's" existence. We saw that we must leave a message encrypted for this future Octopus to bring the refugee humans from Maldek to Earth. When the future time arrived and Flame was born our octopi seers realized he was the one to renew the cycle that would eventually result in our beginnings as a species on earth.Flame was chosen to be the head time traveller for our civilization. He was to be called "The Protector of All TIME" and was sent deep into the past to meet with a friendly planetary culture. We also took the time to create a seed stasis culture that would survive the mass extinction of our species in a future war. This group of Learned Seers and their families took themselves to another dimension to preserve our species. They stayed in contact with Flame (The Protector of All Time) who would return to them in stasis after he had saved the human refugees and placed them on earth. When my father, Flame, returned to stasis he got together with my mother and had me. Our stasis point is several million years in your future. However, one of the anomalies of our stasis is that we can instantly contact anyone in the Milky Way Galaxy in all time and Space. That is how I'm contacting you now. Flame Speaks: "As I was growing up we used the grease pencils to write on slate or plastic underwater just as our ancestors had been taught to write by humans thousands of years before when our ancestors still lived on earth. At the time I was born on our Aquatic planet, (We just called it "home" in our telepathic language) there were only sea creatures, our robot caretakers and ourselves underwater. We didn't concern ourselves much with the birds and animals and other air creatures that lived above the water at first. When the human colonists that came to the planet with us died of some unexplainable disease we were left alone and afraid. I was born about 10,000 years after tha last human planetary colonist died. We Octopi worshipped humans as we believed they had created both us and the sentient underwater robots that cared for us and fed us. 75% of the octopi at the time of the "great Death" that we call it died soon after the last humans died. They just could not survive without their "Gods" the humans. I have been told by my parents that since most of us then had been bred in captivity by that time for over 1000 years that their was no memory left among any of us of ever fending for ourselves in the oceans of earth or anywhere else. Anger at being abandoned by our Gods, the humans allowed some of us to experiment with new food sources. A few of us became cannibals and ate each other but those ones were soon ostracized and eventually starved to death and did not breed. Some of us discovered new food sources and others of us tried reprogramming our large underwater robots to help us survive. Through reprogramming our robots we found we could kill anything on our planet that we needed for food. Our robots learned to kill sharks and larger fish and whales and then the robot would bring it to us so we could all eat it at once until it was gone. However, by the time I was born we had trained the sentient robots to raise food for us. I was born into the leadership class of octopi. So I was sent to a special school for octopi world leaders and diplomats. When a Galactic Time Guard ship was sent to our planet to train a Galactic Octopus leader to rule us I was chosen. I was very frightened to leave my planet to be trained. However, my father said he thought I might be the one. He brought out ancient prophesies for me to read from 8,000 years before I was born which predicted that one of us would eventually join the Galactic Time Guard and begin the human Octopi cycle once again on earth through a trip back through time. In this way our Octopi culture could repay what the humans had done for us by allowing them to live on earth. Though I was scared to leave my family and friends I agreed to go with the Galactic Time Guard unti visiting our planet. As we left I had a funny feeling that I might never see home again. Ten years later my culture and species were wiped out by an invasion from another planet. I never saw my parents or siblings again. However, after I saved the remnants of Maldek I returned to my planet before the time in which I was born and married and raised a family. My son and I then took colonists to another planet so some of our race and culture could survive in a new home and live and breed there. When I originally went with the Galactic Time Guard Unit I was not well treated because I was the only water breather present. Some of the air breathers were afraid of me because I could not speak or make any noises except by slapping my tenticles. Because I was only telepathic they became very frightened of me. I couldn't think in the ways of air breathers because beings who only telepath but don't speak process information completely differently that those who speak and breathe air. Though I survived the ordeal it definitely was not pleasant. Eventually, we arrived on the training planet and there I met other water and other types of liquid breathers somewhat like myself. There I made friends and swam in schools with them while we practiced our lessons. After several years I was sent on missions for the Time Guard to aquatic worlds to protect the integrity of Galactic Time. I gained quite a reputation for myself for efficiency in my work. My relatives and I were always very methodical in our operations plus we always went over in our minds we could think of incase anything went awry. In this way we were always prepared for anything, (we hoped). I was promoted over the years and became friend with many planetary leaders. When I was called on to help the survivors of the planet Maldek, (the solar systems asteroid belt now), I was the nearest Time Guard agent available. There was great distaste dis-ease throughout the galaxy at the destruction of a whole planet. And one that legally couldn't be brought back through time manipulation. No one wanted the job of rescuing the survivors of a nuked planet in pieces. Even though I too was distressed at the idea of a whole planet and its peoples and cultures gone, I knew the legend that one of my kind would save the human race in the solar system by helping the survivors move to Earth. So I altered time to arrive just after the destructive event. I arrived exactly 2 hours earth time later. (We Octopi still functioned on earth time to honor our human Gods) even though the days and night no longer matched on my planet. In order to compensate would would telepath: "Day and then time or Night and then time". If confusion arose we would then say It is 4 hours after daybreak. Even though it was very inconvenient we did this to honor our human Gods for thousands of years. I was horrified as I came near to what was once the planet Maldek I saw millions of multilated bodies and millions more body parts drifting in space. There were all sorts of land a sea creatures drifing in space as well. Parts of the oceans congealed in space like water tends to without gravity. Some of the sea creatures of Maldek were in the water congealed. However, the oxygen soon slipped away into space out of the water and the oceans eventually froze in space because of the distance from the sun without a planet on atmosphere to protect the ocean from freezing. After placing the survivors in my ship, I went forward in time to see what the solar system would look like in 1 to 5 years. Pieces of Maldek hit Mars so I knew the rescued Maldekians would be killed if we took them there. I also noticed that pieces of the planet hit earth and killed off most of the dinosaurs in North America. When I discovered this I got permission to resettle the survivors of Maldek about 10 years into the future in North America. I created two colonies, one on the western coast of North America and one on the East Coast. I then had a large doorway brought to the east and and one to the west coast where trucks could be drived through the door and instantly arrive on the east coast or vice versa. In this way if either colony was wiped out there would be escape to the other in an emergency. The recolonization effort worked out just fine. However, when I asked for permission to try to prevent the war I realized I wasn't thinking clearly. To make things worse the general who gave me permission to try to prevent the war had been involved in extincting my species on my home planet and wanted me to somehow self destruct too. I think he was offended that we thought earthborn humans were Gods. Anyway, I shouldn't have been given permission to change the war. When I tried and failed, he pretended not to have given me verbal permission to do so and I was left with no where to turn. As punishment for my failure I was dishonorably discharged from the Time Guard and given a small time ship to go out into space and to take my own life somehow. Instead, I decided to fly into a Star but at the last moment I slammed through time only appearing to have died in the star's heat fusion. I went back in time before I was born and returned to my planet of octopi during its golden age and married and had children. I then took several trips with all my children and anyone else who wished to colonize another world and took them all to a water planet on which I knew we all would be safe for hundreds of thousands of years. Since my time ship had been given to me and was powered by a form of energy that never runs out and is self maintaining, I decided to take my son and return to earth to find out more about forerunner, the octopus of earth who started our spacefaring race and aquatic culture. In the process I found Jonathan on Maui in 1989 and began talking with him since I recognized him as my own soul living another life there. Through Jonathan I found out about King Interlaken, Arcane and even Eridian. Truth is definitely stranger than fiction! 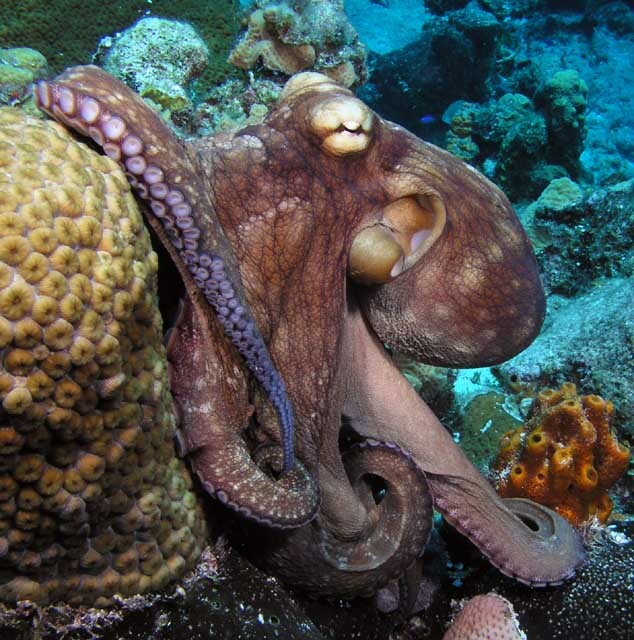 So, it is interesting that an Octopus (octopus vulgaris) already is 10 feet from the top of his or her head to the tip of it's tentacles without being genetically engineered by humans. for more interesting facts about the octopus including facts on its learning ability go to octopus.com and wikipedia.com and any books on them or any experts you can speak with. Here is an octopus photo that Flame approves of. However, I'm not sure why.